The ∂E/∂t term implies that changing electric fields produce magnetic effects (i.e. some circulation of B, i.e. the c2∇×B on the left-hand side). We need this term because, without it, there could be no currents in circuits that are not complete loops, like the circuit below, which is just a circuit with a capacitor made of two flat plates. The capacitor is charged by a current that flows toward one plate and away from the other. It looks messy because of the complicated drawing: we have a curve C around one of the wires defining two surfaces: S1 is a surface that just fills the loop and, hence, crosses the wire, while S2 is a bowl-shaped surface which passes between the plates of the capacitor (so it does not cross the wire). Now, actual capacitors are not made of some infinitely thin sheet of charge: they are made of some conductor and, hence, we get that shielding effect and we’re talking surface charge densities +σ and −σ, so the actual picture is more like the one below. Having said that, the formula above is still correct: E is σ/ε0 between the plates, and zero everywhere else (except at the edge, but I’ll talk about that later). We’re now ready to tackle the first property of a capacitor, and that is its capacity. In fact, the correct term is capacitance, but that sounds rather strange, doesn’t it? Q is the total charge on each plate (so it’s positive on one, and negative on the other), A is the area of each plate, and d is the separation between the two plates. What the equation says is that the voltage is proportional to the charge, and the constant of proportionality is d over ε0A. Now, the proportionality between V and Q is there for any two conductors in space (provided we have a plus charge on one, and a minus charge on the other, and so we assume there are no other charges around). Why? It’s just the logic of the superposition of fields: we double the charges, so we double the fields, and so the work done in carrying a unit charge from one point to the other is also doubled! So that’s why the potential difference between any two points is proportional to the charges. Now, the constant of proportionality is called the capacity or capacitance of the system. In fact, it’s defined as C = Q/V. [Again, it’s a bit of a nuisance the symbol (C) is the same as the symbol that is used for the unit of charge, but don’t worry about it.] To put it simply, the capacitance is the ability of a body to store electric charge. For our parallel-plate condenser, it is equal to C = ε0A/d. Its unit is coulomb/volt, obviously, but – again in honor of some other guy – it’s referred to as the farad: 1 F = 1 C/V. Onward! Let’s move to the next thing. Before we do so, however, let me quickly give you the formula for the capacity of a charged sphere (for a parallel-plate capacitor, it’s C = ε0A/d, as noted above): C = 4πε0a. You’ll wonder: where’s the ‘other’ conductor here? Well… When this formula is used, it assumes some imaginary sphere of infinite radius with opposite charge −Q. OK… Next thing. The next thing is to look at the dielectric material inside capacitors. You know the dielectric inside a capacitor increases its capacity. In case you wonder what I am talking about: the dielectric is the waxed paper inside of that old-fashioned radio-type condenser, or the oxide layer on the metal foil used in more recent designs. However, before analyzing dielectric, let’s first look at what happens when putting another conductor in-between the plates of our parallel-plate condenser, as shown below. Now, because 0 < 1 − b/d < 1, we have a factor (1 − b/d)−1 that is greater than 1. So our capacitor will have greater capacity which, remembering our C = Q/V and U = (1/2)·C·V2, formulas, implies (a) that it will store more charge at the same potential difference (i.e. voltage) and, hence, (a) that it will also store more energy at the same voltage. So what happens when we put a dielectric in-between. It’s illustrated below. The field is reduced but it is not zero, so the positive charge on the surface of the dielectric (look at the gaussian surface S shown by the broken lines) is less than the negative charge on the conductor: in the illustration below, it’s a 1 to 2 ratio. If your physics classes in high school were any good, you’ve probably seen the illustration above. Having said that, the physical model behind is more complicated, and so let’s have a look at that now. The micro-model doesn’t matter very much. The whole analysis hinges on the concept of a dipole moment per unit volume. 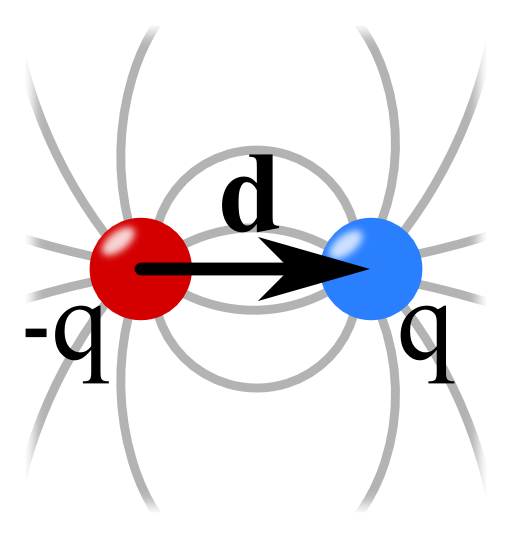 We’ve introduced the concept of the dipole moment tout court in a previous post, but let me remind you: the dipole moment is the product of the distance between two equal but opposite charges q+ and q−. P = Nqδ, with N the number of dipoles per unit volume. P is uniform, i.e. constant, across our sheet of material. P is not uniform, i.e. P varies across the dielectric. So let’s do the first case first. This assumption gives us the mathematical model of the dielectric almost immediately. Indeed, when everything is said and done, what’s going on here is that the positive/negative charges inside the dielectric have just moved in/out over that distance δ, so at the surface, they have also moved in/out over the very same distance. So the image is effectively the image below, which is equivalent to that mathematical of a dielectric we presented above. Of course, no analysis is complete without formulas, so let’s see what we need and what we get. As for the assumption of linearity between E and P, there’s stuff on the Web on non-linear relationships too, but you can google that yourself. 🙂 Let’s now analyze the second case. The analysis for non-uniform polarization is more general, and includes uniform polarization as a special case. To get going with it, Feynman uses an illustration (reproduced below) which is not so evident to interpret. Take your time to study it. The d connects, once again, two equal but opposite charges. The P vector points in the same direction as the d vector, obviously, but has a different magnitude, because P is equal to P = Nqd. We also have the normal unit vector n here and an angle θ between the normal and P. Finally, the broken lines represent a tiny imaginary surface. To be precise, it represents, once again, an infinitesimal surface, or a surface element, as Feynman terms it. Now, while the illustration above, and the formula, show us how some charge moves across the infinitesimal surface to create some surface polarization, it is obvious that it should not result in a net surface charge, because there are equal and opposite contributions from the dielectric on the two sides of the surface. However, having said that, the displacements of the charges do result in some tiny volume charge density, as illustrated below. Well… That says it all, I guess. To make sure you understand what’s written here: please note, once again, that the net charge over the whole of the dielectric is and remains zero, obviously! The only question you may have is if non-uniform polarization is actually relevant. It is. You can google and you’re likely to get a lot of sites relating to multi-layered transducers and piezoelectric materials. 🙂 But, you’re right, that’s perhaps too advanced to talk about here. This entry was posted in Physics and tagged capacitor, capacity, energy of capacitors, energy of condensers, farad, volt. Bookmark the permalink.